(Martin, MI) – Marshall Plastic Film has been recognized as one of the 2013 “Michigan 50 Companies to Watch,” an awards program sponsored by the Edward Lowe Foundation and presented by Michigan Celebrates Small Business. Marshall Plastic Film will be honored at an awards ceremony during the ninth annual Michigan Celebrates Small Business event, May 2, 2013 in Lansing, Mich.
Marshall Plastic Film produces polyethylene and polypropylene film and bags for use in a wide range of industries. Each of these industrial customers depends on Marshall Plastic Film to develop and produce innovative solutions for their particular packaging needs. An example is the Company’s response to needs in the Pharmaceutical Industry for Intermediate Bulk Packaging. This specialized response has earned the Company recognition as the premier provider in the industry, with a global customer base involving more than 50 Pharmaceutical Companies. John Roggow stated, “This award is a true honor and is recognition of the hard work supplied by the entire Marshall Plastic Film team”. A major test of the team’s dedication came after the 2009 recession when the “specialized response” focus kept the Company vibrant as an employer, an important part of the local community and a continuing resource for its’ customers. This award validates everyone’s efforts. Marshall Plastic was nominated for this award by Melissa Angel of the MI-SBTDC. Melissa, who at the same ceremony was recognized as the MI-SBTDC Small Business Counselor of the Year, has been instrumental in assisting Marshall Plastic to develop strategic plans designed to continue growth in the pharmaceutical and other key markets. Companies making it to the “Michigan 50 Companies to Watch” list are a remarkable group of second-stage companies. Defined as having 6 to 99 full-time-equivalent employees and generating $750,000 to $50 million in annual revenue or working capital from investors or grants, these companies form the backbone of Michigan’s economy. Representing all regions of the state and a diverse range of industries, companies like Marshall Plastic Film are known for their exceptional entrepreneurial leadership, creation of innovation or use of innovation in creative ways, and their sustainable competitive advantage. Founding underwriters are the Michigan Economic Development Corporation, PNC Bank, Michigan Certified Development Corporation, Accident Fund Insurance Company of America and Dynamic Edge, Inc. Contributing Underwriters are DTE Energy Foundation, Comcast Business Class, Michigan Credit Union League & Affiliates, Rehmann, Varnum Attorneys at Law, Consumers Energy, Comcast Spotlight and AARP. Michigan Celebrates Small Business was founded by the Michigan Small Business & Technology Development Center, Michigan Economic Development Corporation, U.S. Small Business Administration, Small Business Association of Michigan, Greater Lansing Business Monthly and Edward Lowe Foundation. 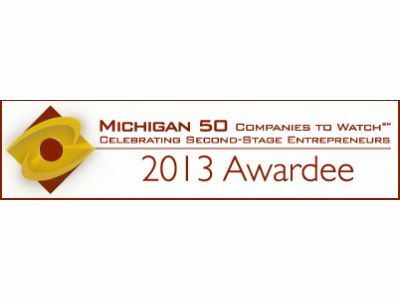 Information about next year’s Michigan 50 Companies to Watch program can be found at www.Michigan.CompaniesToWatch.org. For information about Michigan Celebrates Small Business, visit www.MichiganCelebrates.biz.